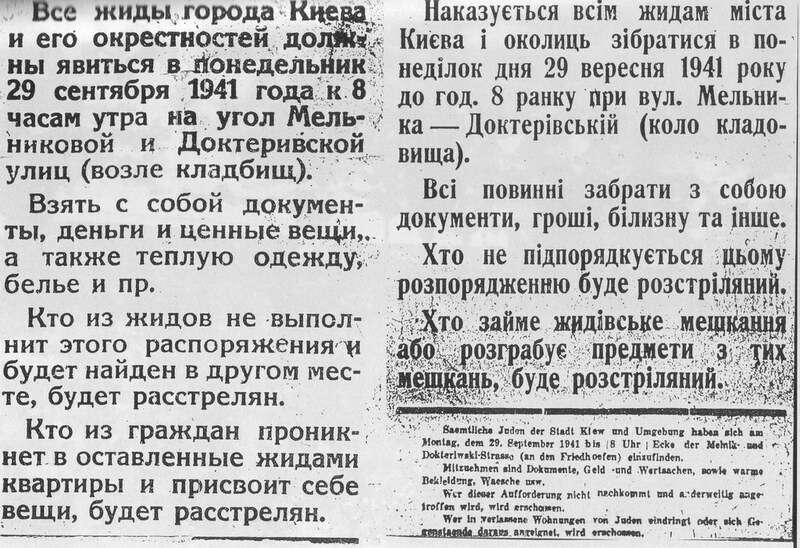 All Jews of the city of Kiev and its vicinity are to arrive by 8 o'clock on the morning of Monday, September 29th, 1941, to the corner of Mel'nikova and Dokterivskaja streets (near the cemeteries). Any Jew not carrying out this instruction and who is found elsewhere will be shot. Any citizen entering flats abandoned by the Jews and stealing property will be shot. 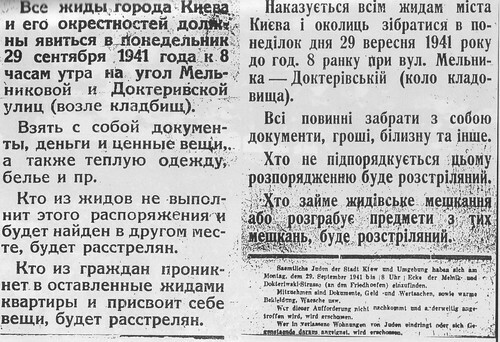 (Note 1: A. Kuznetsov quotes another version of the notice, in which the names of the streets were transcribed as "Mel'nikovskoj i Dokhturovskoj", not as "Mel'nikovoj i Dokterivskoj"; the real streets were actually called Mel'nikova street and Degtyaryovskaja street - it is obvious that the Germans used some bad translator, not a local. Note 2: the word used in the Russian version is "zhidy", at that time an offensive term, probably better translated as "kikes". The next day thousands of Jews gathered for a "resettlement". The fate of these Jews is described in at least 9 German war-time documents. On September 24, violent explosions in the quarters of the Feldkommandatur; the ensuing fire has not yet been extinguished. Fire in the center of the town. Very valuable buildings destroyed. As has been proved, Jews played a pre-eminent part. Allegedly 150,000 Jews living here. Verification of these statements has not been possible yet. 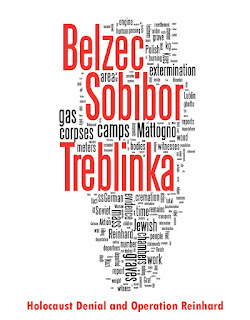 1,600 arrests in the course of the first action, measures being evolved to check the entire Jewish population. Execution of at least 50,000 Jews planned. German Army welcomes measures and demands drastic procedure. Garrison commander advocates public execution of 20 Jews. Quoted by Mikhail Koval' in "Tragedija Babjego Jara: istorija i sovremennost'", Novaja i novejshaja istorija, 1998, no. 4. He quotes another secondary source, but gives the archival source as GARF, f. 7445, op. 2, d. 138, l. 269. As a result of the destruction of buildings in particular and of the evacuation of the endangered districts ordered by the authorities, approximately 25,000 persons were deprived of shelter and had to spend the first few days of the occupation outdoors. The inconveniences resulting from this were accepted by the population with calm. No serious incidents or panic occurred. Meanwhile the evacuated apartments, as far as they were not destroyed by fires or explosions, have again been put at the disposal of the population. Besides an adequate number of apartments has been evacuated through the liquidation of approximately 35,000 Jews on 29 and 30 September 1941, so that now shelter for the homeless is secured and has meanwhile also been allocated. Partly because of the better economic situation of the Jews under the Bolshevist regime and their activities as informers and agents of the NKVD, partly because of the explosions and the resulting fires, the public feeling against the Jews was very strong. As an added factor it was proved that the Jews participated in the arson. The population expected adequate retaliatory measures by the German authorities. Consequently all Jews of Kiev were requested, in agreement with the city commander, to appear on Monday, 29 September by 8 o'clock at a designated place. These announcements were posted by members of the Ukrainian militia in the entire city. Simultaneously it was announced orally that all Jews were to be moved. In collaboration with the group staff and 2 Kommandos of the police regiment South, the Sonderkommando 4a executed on 29 and 30 September, 33,771 Jews. Money, valuables, underwear and clothing were secured and placed partly at the disposal of the NSV [Nazi Party Public Welfare Organization] for use of the racial Germans, partly given to the city administration authorities for use of the needy population. The transaction was carried out without friction. No incidents occurred. The "Resettlement measure" against the Jews was approved throughout by the population. The fact that in reality the Jews were liquidated was hardly known until now, according to up-to-date experiences it would, however, hardly have been objected to. The measures were also approved by the Wehrmacht. The Jews who were not yet apprehended as well as those who gradually returned from their flight to the city were in each case treated accordingly. The Jews of the city were ordered to present themselves at a certain place and time for the purpose of numerical registration and housing in a camp. About 34000 reported, including women and children. After they had been made to give up their clothing and valuables, all were killed; this took several days. The embitterment of the Ukrainian population against the Jews is extremely great, because they are thought responsible for the explosions in Kiew. They are also regarded as informers and agents of the NKVD, who started the terror against the Ukrainian people. As a measure of retaliation for the arson at Kiew, all Jews were arrested and altogether 33,771 Jews were executed on the 29th and the 30th September. Money, valuables and clothing were secured and put at the disposal of the National-Socialist League for Public Welfare [NSV], for the equipment of the National Germans [Volksdeutschen] and partly put at the disposal of the provisional city administration for distribution to the needy population. The difficulties resulting from such a large-scale action, in particular concerning the round-up, were overcome in Kiev by requesting the Jewish population to assemble, using wall posters. Although at first only the participation of 5-6000 Jews had been expected, more than 30,000 Jews arrived who, until the moment of their execution, still believed in their resettlement, thanks to extremely clever organization. Undersecretary Luther himself wrote a summary of the sixth report, noting that in the Ostland all male Jews over 16 other than doctors and council members would be executed, and that at the conclusion of the action only 500 Jewish women and children would be left alive. He also noted that 33,000 Jews in Kiev, 3,000 in Vitebsk and 5,000 east of the Dnieper had been shot. The summary was initialed by State Secretary Weizsaecker the day it was written. The Origins of the Final Solution, 2004, p. 402. From testimonies of survivors, perpetrators, bystanders, and from the extraordinary set of photos made by Johannes Haehle we know that the massacre happened in the ravine known as Babiy Yar (Babij Jar, Babyn Yar, Baby Yar). Given the wealth of documentary evidence, I won't even start citing the testimonial evidence for the massacre. Now, no sane and smart person would even think of challenging the event supported by such iron-clad evidence. But, of course, Holocaust deniers do just that - they either deny or minimize the massacre. Let's see what tricks they use. Our first patient is certain Herbert Tiedemann, who has written an article "Babi Yar: Critical Questions and Comments" (old version) for Rudolf's Dissecting the Holocaust. There is not much sense in responding to each and every little "point" Tiedemann makes. It will be sufficient to point out the most significant flaws. 1) Tiedemann does not deal with the documents quoted above except in the most general terms. For example, he mentions the document no. 7 only to cast doubt on it, by citing its exaggerated estimate of pre-war Jewish population of Kiev, as if that could discredit the document in any way. He doesn't quote the incriminating part. 2) In the old version Tiedemann was not even aware of Anatolij Kuznetsov's magnificient Babi Yar: A Document in the Form of a Novel, which just shows that this ignoramus undertook his "debunking" without ever reading one of the most important books on the subject. 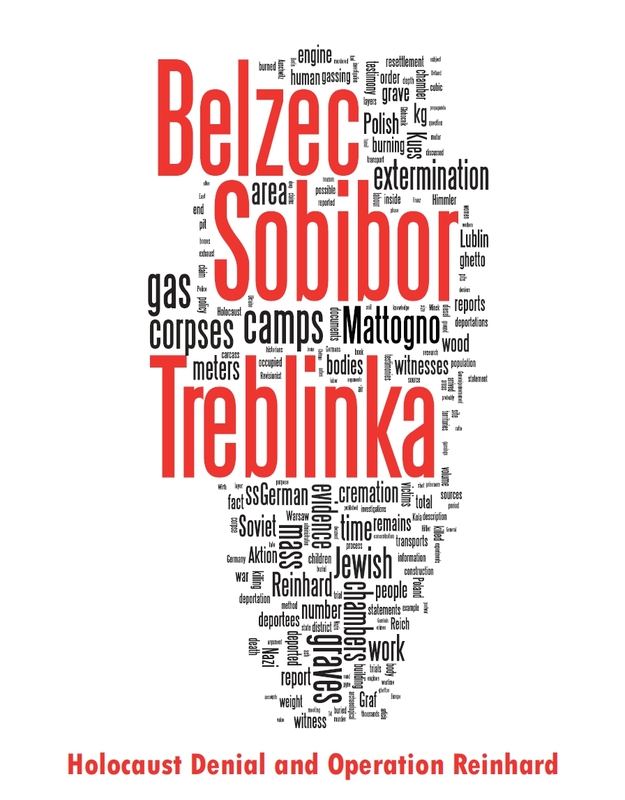 3) In both versions Tiedemann quotes only one Jewish Sonderkommando, Vilkis (without designating him as such). Even after finally finding Kuznetsov's book, he doesn't mention Vladimir Davydov, whose testimony is contained therein. Neither is he aware of Kaper, Budnik or Trubakov. Such ignorance is breathtaking. According to the Brockhaus Enzyklopädie the "order for the final solution of the Jewish question" was issued on July 31, 1941 (Nuremberg Trial Document NG 2586e), and was announced on the occasion of the 'Wannsee Conference' (January 20, 1942). Quite aside from the fact that historians and other interested persons are still searching in vain for this order for mass extermination, it is more than odd that many tens of thousands would have been slaughtered in Babi Yar before the order was even made known. Well, duh! Anybody seriously interested in the matter knows that Wannsee conference was concerned with the "solution of the Jewish question" not on the Soviet territory, but rather in a pan-European framework. Genocide of the Jews in USSR started much earlier than in the rest of Europe, and before Hitler decided that all European Jews were to be killed. This is Holocaust Historiography 101. "Not a single Jew is left in Kyiv because Germans have thrown the entire Jewish population in Kyiv into the river Dnjepr." Was there not one among all those tens of thousands who could swim? This killing method would have endangered the troops' own water supply, while also causing a very considerable danger of epidemic - a nightmare for any troop commander. The bodies would have drifted downstream and been noticed by countless witnesses. Why are there no such witnesses? Pray tell, how this is relevant at all? Yes, an underground agency made a wrong claim. How does this affect the historicity of event itself? Note Tiedemann's "poignant" questions. Since nobody argues that the Jews were drowned in Dniepr, why ask them? Beating dead horses seems to be Tiedemann's hobby. A physician named Dr. Gustav Wilhelm Schübbe allegedly killed 21,000 persons single-handedly, with morphine injections. 110,000 to 140,000 victims were allegedly killed in this way at the "German Annihilation Institute" in Kyiv. Injections of morphine, which was in very short supply and badly needed for wounded soldiers? And how long would it take one physician to give 21,000 injections? According to the files of the US Document Center in Berlin, which holds more than one million records pertaining to members of the NSDAP ('Nazi' Party), Dr. Gustav Wilhelm Schübbe was never stationed in Kyiv. Why did neither the USSR nor the Jews ever search for the location of this "Annihilation Institute"? Again, one strives to find a reason for inclusion of this into the article about Babiy Yar, and doesn't find it. Worst of all, Tiedemann does not even mention the most relevant fact - that Schuebbe was a crippled drug addict. Since Tiedemann employs this trick throughout the article, it can be safely dismissed as one big non sequitur. Was he able to find a 'Tiraspolskaja Street' (that's how it would be written correctly!) on a street map of Kyiv, and near the 'place' Babi Yar (which is not a 'place' at all)? As any decent map of Kiev will show, there still IS Tiraspolskaja street, which is indeed situated not far from former Babiy Yar. How even the idea itself to ask such a question came into poor Tiedemann's head? Oh, inanity! Well, enough of this. Even reading through this "study" makes one feel stupid. There are still some points to be addressed, such as the overall number of victims and aerial photos, and that will be done in due time. Are all of the ARs refer mainly the operations on 29-30 September, or some others like the 454 SD described another operation? What is the death toll in total, from September-Novenmber?